Montreal rejoined the International League in 1928. 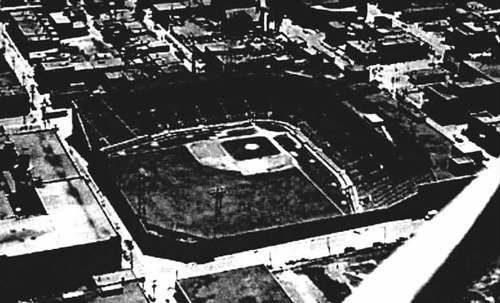 The new Royals, the Brooklyn Dodgers' top farm club, played in a new concrete and steel ball park known officially as Montreal Stadium, more commonly as Delorimier Downs. Home plate was located near the corner of Ontario and Delorimier Streets, in Montreal's East End. Delorimier ran�along the third�base line. Lariviere Street bordered the left field wall, and Parthenais Street ran behind the right field scoreboard (there were no outfield�stands). Ontario, one of the main streets in the East End, bordered the first base line. In some pictures of the ball park, the Grover Knit-To-Fit Mills building, topped by its water tower, is visible behind the scoreboard. The triple-A Royals were the last stop for many Dodger farmhands on their way to the major leagues. Boys Of Summer Carl Furillo, Duke Snider, Roy Campanella, Jim Gilliam, and Don Newcombe played on this field. Don Drysdale later pitched here, as did future Dodger manager Tommy Lasorda. Delorimier Downs' most notable alumnus was a young man from Georgia via the University of�California at Los Angeles, who reprersented Dodger boss Branch Rickey's boldest experiment, Jackie Robinson. Rickey had decided to integrate the major leagues. Once he found a player with the right combination of talent and temperament, the plan was to start him in multi-cultural Montreal, where he'd feel more at ease than in the racially polarized United States. Unpredictable, often nasty April weather always had the Royals opening on the road. Jackie broke the color line in Jersey City's Roosevelt Stadium, but called Delorimier Downs home for the 1946 season. The Royals clinched the Junior World Series at home, defeating the American Association champion Louisville Colonels. Fans celebrated in the streets of Montreal. One sportswriter noted that it was probably the first time white people has chased a black man with love, and not hate, on their minds.